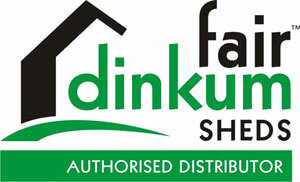 All Shed Solutions are proudly SA’s premier Fair Dinkum Sheds distributor. We have been servicing the Mount Barker, Adelaide Hills and Victor Harbour regions since 2003. Fair Dinkum Sheds is the leading distributor of residential garages and carports, barns, farm sheds, industrial and commercial buildings and is widely acknowledged as one of the largest networks of Cold Formed Steel Building distributors in Australia. Fair Dinkum products are sold through a network of over 160 distributors all over Australia who can quote and design buildings in minutes with our hi-tech software program. All buildings are fully engineered to accommodate the region where your garage/shed will be built and standard plans can be supplied within a few minutes. Through Fair Dinkum Sheds, All Shed Solutions can offer a wide range of colours with galvanised steel frames for strength and low maintenance. Vertical cladding is standard with all of our buildings; speak to your All Shed Solutions contact about other options. We welcome you to view this site where you can see our product range and download a brochure or request a hard copy. You can even request a quote, using the options below. Visit our Shed Design page to use the web app. Click to visit the App Store on your mobile. Click to visit Google Play on your mobile.